A Burp extension to detect and exploit versions of Telerik Web UI vulnerable to CVE-2017-9248. This extension is based on the original exploit tool written by Paul Taylor (@bao7uo) which is available at https://github.com/bao7uo/dp_crypto. Credits and big thanks to him. 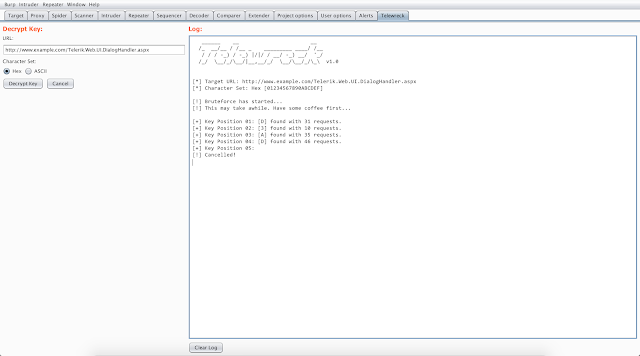 A related blog post on how to exploit web applications via Telerik Web UI can also be found here. 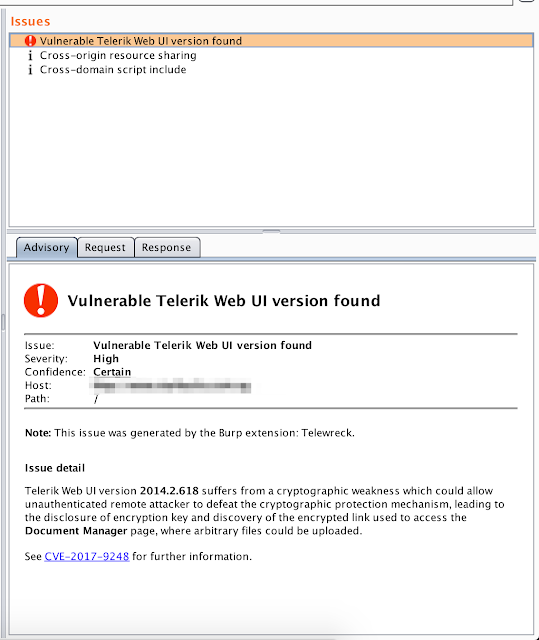 Detect vulnerable versions of Telerik Web UI during passive scans. Bruteforce the key and discover the "Document Manager" link just like the original exploit tool. Download telewreck.py to your machine. Install Python's requests module using sudo pip install requests. On your Burp, go to Extender > Options tab. Then under the Python Environment section, locate your jython-standalone-2.7.0.jar file (1) and the directory where Python's requests module is located (2). 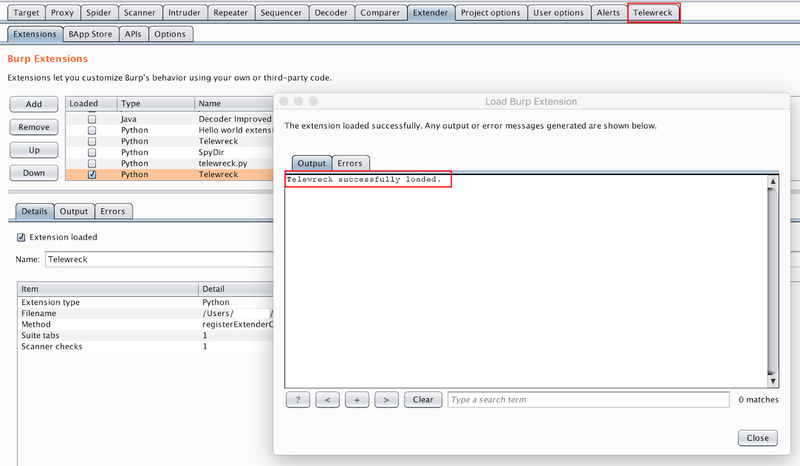 Go to Extender > Extensions tab, then click on the Add button. On the new window, browse the location of telewreck.py and click the Next button. If there's any error, the Telewreck tab would appear in your Burp. This extension requires Python's requests module. Just run pip install requests to install it. The text area under Telewreck tab doesn't function as a console. So, stoud and stderr outputs cannot be seen there. 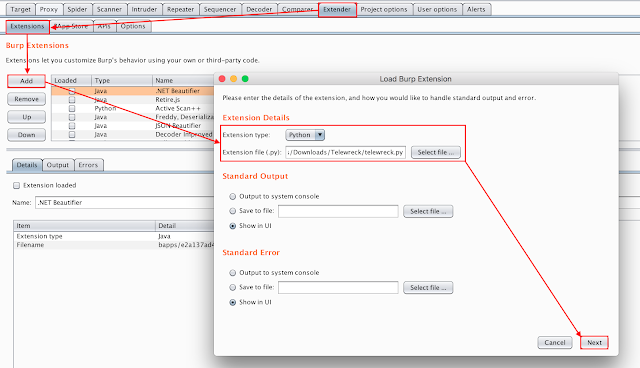 However, you can view them under the Output and Errors sections of the Extender tab. 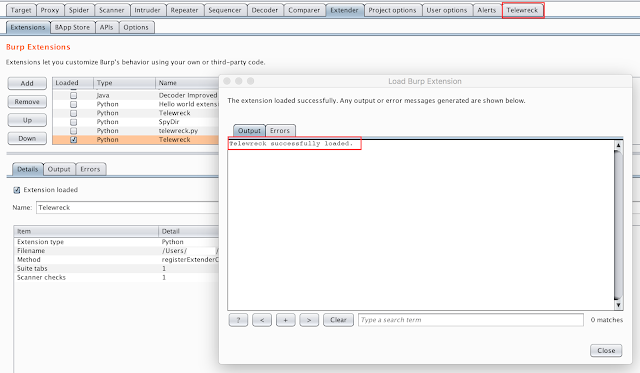 Before running another bruteforce, cancel the current process first by clicking the Cancel button. If the key can't be bruteforced, then probably the key has been set up securely and/or the application is not using a default installation of Telerik. If the key can't be bruteforced and/or there are some issues, it's recommended to fall back to the original exploit tool.